RAVENOL USVO® RSS Racing Sport Synto 10W-60 is a modern, PAO (poly-alpha-olefin) based fully synthetic multigrade engine oil with USVO® Technology. Due to the special mixture of synthetic, highly polar Group V base oils with a high proportion of high and low viscosity PAO, it has been formulated without the need for viscosity index improvers. The incredibly low shear rate of RAVENOL USVO® Racing Engine Oils is a major factor in dramatically reducing fuel dilution when running at full throttle. The USVO® technology offers high performance, improved engine protection, reduced fuel consumption and optimised engine cleanliness for your vehicle. It has a high viscosity index, high HTHS value, extreme shear stability and a highly effective unique additive package using molybdenum and tungsten. This smooths the surface structure of the engine, reducing friction and wear, whilst significantly improving mechanical efficiency. It ensures a secure lubrication layer even at very high operating temperatures, protection from corrosion (oxidation) and foaming. The extremely low pour-point ensures optimal lubrication when cold, whilst the incomparible low friction capabilities release maximum power from the engine - from the second the lights go green to the moment that the chequered flag waves. Tested at the Nürburgring and our partner circuit, the Hockenheimring. Used and recommended by ADAC GT Masters, FIA F3 European Championship, Opel Motorsport and many rally teams. 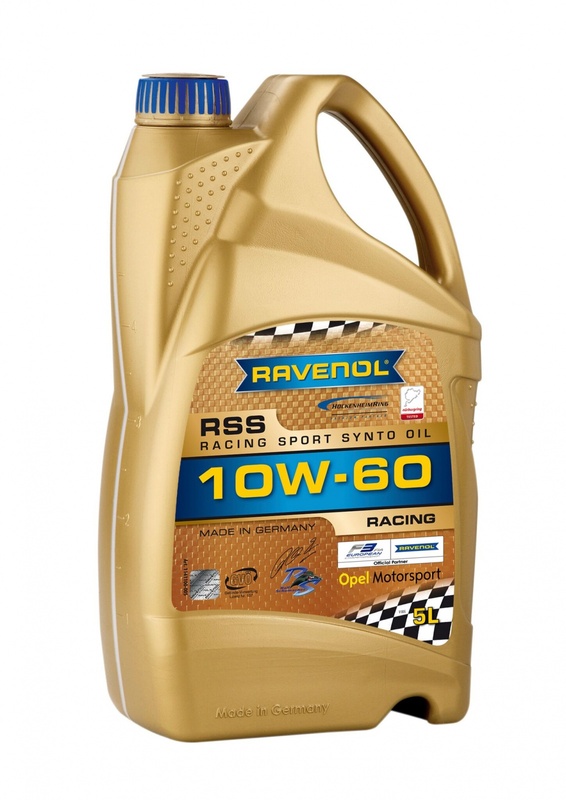 RAVENOL RSS 10W-60 has been specifically developed for competition use in the most severe race and rally conditions. It's exceptional high temperature performance makes it also ideal for modified, track day and fast road vehicles. Suitable for use in both turbo and non-turbocharged engines. Julian Millington from Millington Racing Engines undertook extensive dyno tests using a Millington Diamond engine: "After I Dyno tested the old formula and the new formula at similar conditions/temperatures within 25 minutes of each other, I found that the newer formula consistently held 5-6 PSI higher oil pressure at idle, even at higher temperatures. I would rather that than any other improvement on the oil". At the end of the test Julian ran the engine at such a low tick-over it was almost stalling - with an oil temperature of 92 degrees centrigrade the pressure guage was reading 30psi - "That is just amazing!" commented a very impressed Roy Millington who was looking on "That would save an engine! ".